Licensed massage therapist and certified registered reflexologist Laurie Azzarella, of Daphne, Alabama, has launched a new empowering educational program called Reflex-OIL-ogy. In these classes, parents, caregivers, oilers and professional bodyworkers benefit from learning how to therapeutically apply essential oils to enhance the functionality of the body and its systems. 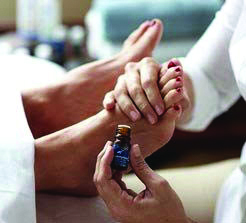 In this 8-hour course, taught in one day, students gain a practical, in-depth understanding of each body system’s function so they can assess reflex areas on feet and hands and then, using a unique application technique, apply appropriate essential oils. Stretching, muscle relaxation, energy and meridian points plus proprietary Emotional Congestion Release Technique is also incorporated into each module. For class schedule and more information, call 850-380-4943 or visit Reflex-OIL-ogy.com.